Rainer Weiss, Barry C. Barish and Kip S. Thorne have won the 2017 Nobel Prize in physics. The three are members of the LIGO-Virgo detector collaboration that discovered gravitational waves. 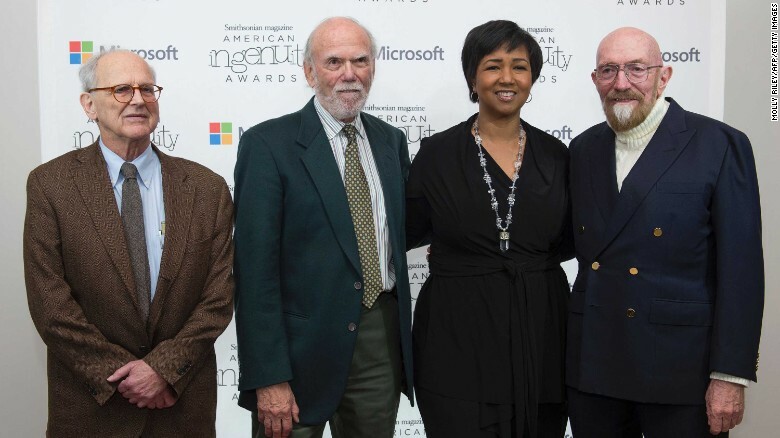 The prize was awarded “for decisive contributions to the LIGO detector and the observation of gravitational waves,” the committee said in a news release. “This year’s prize is about a discovery that shook the world,” said the Nobel committee representative Göran K. Hansson during a conference in Stockholm on Tuesday. One half of the prize went to Weiss, born in Berlin and now a U.S. citizen, is a physics professor at the Massachusetts Institute of Technology. The other half was split by Barish, a Nebraska native, and Thorne, who was born in Utah. Both work at the California Institute of Technology. “When we first discovered them back in September 2015 many of us didn’t believe it,” said Weiss, on the phone to the Stockholm conference. It took months for the scientists to convince themselves that had in fact heard gravitational waves, he said. Who will win a Nobel physics prize is often anyone’s guess; the selection process is notoriously secretive. But that does not curb speculation. The detection of black hole gravitational waves has been floated as a contender both this year and last. This year, the predictions came true. A team of more than a thousand scientists, researchers and technicians, making up the LIGO Scientific Collaboration, discovered the first gravitational ripple in space-time in September 2015. Detectors have sensed three other gravitational waves since then, all from merging black holes. The LIGO team, plus the Italian Virgo detector, announced the most recent cosmic distortion discovery in September. “The two observatories in Louisiana and Washington state had to be built in remote, seismically stable locations. The dominant feature of each facility is the pair of 2.5-mile-long beam lines, set perpendicularly. These are tubes in which laser beams pass through an almost perfect vacuum. “A reporter drove a rental car the length of the arm, with Stuver serving as narrator. The beam line is encased in heavy concrete. Stuver said that so few atoms and molecules remain in the vacuum tubes that if you could gather them all up, from the entire 2.5-mile length, and compress them to normal atmospheric pressure, they’d amount to one thimbleful of air. Aside from his work on LIGO, Thorne is known for his theories about time travel. He was a consultant on the sci-fi movie “Interstellar” and came up with a wormhole plot device that allows astronauts in the film to go back in time. Barish was not included in some previous awards to the LIGO team, and as Science magazine reported, some experts worried that he would miss a shot at a Nobel Prize. He is credited with reviving the project after early problems and managing the ambitious and unwieldy collaboration. The death in March of Ronald Drever, a LIGO physicist who was included in previous awards, may have cleared the way for Barish to be included; the Nobel can be split only three ways. LIGO is funded by the National Science Foundation. President Trump proposed a budget cut of 11 percent to the NSF, but Congress has been more supportive of the agency. The Nobel committee has awarded a prize in physics 111 times since 1901. Last year, three researchers won for their work in the field of topology. Topology, as The Washington Post reported, is the study of state changes more intricate than the pivot from liquid to solid. The 2016 laureates discovered exotic transformations that turn matter into superconductors or frictionless liquids, able to swirl in a never-slowing vortex. Winners of the Nobel Prize in physics join a rarefied group that counts Albert Einstein, Marie Curie and Niels Bohr as members. More recent laureates include University of Manchester scientists Andre Geim and Konstantin Novoselov, who won the 2010 prize. They performed groundbreaking experiments with graphene, a lattice of carbon a single atom thick. In 2013, François Englert and Peter Higgs won for predicting a subatomic particle called the Higgs boson, the existence of which was confirmed by the Large Hadron Collider in 2012. The Nobel Prize in chemistry will be announced on Wednesday, the literature prize on Thursday and the peace prize on Friday. An award in economics, not one of the original prizes but now conducted in memory of Alfred Nobel, will be announced Monday. Next articleSo You Want to Go to West Point?